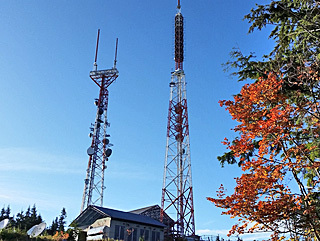 Fall colors on West Tiger Mountain.Here we are looking at what we commonly call – West Tiger #2 or WTM-2. The overall height of the two towers, including antennas, is 350 feet. The towers were made by ERI. The tower on the right holds the FM Master Antenna an 8 bay ERI –Cogwheel that is fed by 6 FM stations via a combiner. Above that, out of the frame, is a presently un-un-used, pole to which used to mounted the KUNS TV antenna (They moved to the Sinclair Tower on Queen Anne Hill). You can find out more about this site by going to the ATC Web Site and looking for Site #’s 7500 and 7509. The FCC has pleased many with officially doing away with the long-standing main-studio-rule in place since before even I was born! Over the years many broadcasters I’ve known have found creative means of working around this one, perhaps it’s time was past? Every once in a while you read a story about someone that discovers something that we, who have been on the planet for a while, have known about all along. In this case, a story was supposedly in the Wall Street Journal got a lot of folks commenting ….The basis was the ‘discovery’ of what was called – a hack- that enabled a person to obtain TV shows – for free by using a little-known item called ‘rabbit ears’. Sure we all laugh about it – but we need to understand that many are blinded by the technology that they embrace. This is similar to those that find that they are completely cut off when the power goes out or the cell phone cannot be re-charged. Or, perhaps discover that milk comes from a cow. I have recently been discovering an example of another disconnect. I have been working on selling my car. In this process, I have uncovered the fact that there are a huge number of people that are totally incapable of driving a vehicle with a manual transmission. Given the choice between a Root-Canal and a driving a 3-pedal car – they don’t know which to choose. 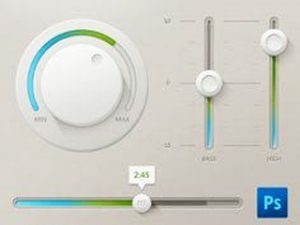 Then there is the matter of the two left-over FM’s (KZOK/102.5 and KJAQ/96.5). There has been a lot of speculation that Bonneville or Hubbard will end up with these two. Then there is the other thought that perhaps ETM would rather do a trade with someone than sell these stations for cash. Perhaps dealing with a major group that would be willing to trade a pair of Seattle FM’s for stations for something they would rather have. This is a more remote idea when you consider that ETM has announced how much money they will be making selling the ‘left-overs’ for a cool $265 M.
On the bright side is speculating on these things, especially when you don’t have a horse in the race. The darker side is being an employee at one of the stations being spun off wondering and wondering. Late word is that this might all come-down later in November – So get those bets in right away! The next step in this adventure will take place on November 15th where the shareholders will meet to cast their votes that will bring the two companies together. The decision of Entercom has already been made with founder Joe Field, having already said yes. Easy when you control the majority of the stock. His Son, David, will be the CEO. After this it’s all up to government regulators at the DOJ and FCC. The FCC is going to make some changes to a number of media ownership rules …The big change will be that broadcasters can now own newspapers again (didn’t it use to be the other way around?) However there will be no change in the number of radio stations that can be owned by one firm. That number is 8 (5-FM’s and 3-AM’s) in a market the size of Seattle. Moving from ‘ear-strain’ to ‘eye-stain’….. Despite the Feds taking a long look at the Sinclair/Tribune deal – The shareholders of the two firms have indicated their approval of the deal. This is a biggie in many ways. Dollar wise we are talking 3900 Megabucks. In the Seattle market this would mean that 4 TV stations would be owned by the same outfit. Knowing that this is not going to fly means the 2 of the areas TV stations are, down-stream, going to be owned by someone else…Mums the word as to who. Like the ETM/CBS deal in Radio – This is wonderful fodder for speculation. So what’s going on with Multilingual EAS Alerts? If you have not followed this – I suggest that you read FCC – 47 CFR 11.21 completely. In all of this EAS Participants (FCCeeze for any FCC Licensee that has an EAS Obligation) that broadcast other than English are to cooperate and participate with their state SECC to identify how they are going to do provide for public warnings via EAS in other than English. The Washington State SECC recently elected to initiate a survey to satisfy their requirements in this process.. Meanwhile – in what appears to be a contradictory move, A Court has upheld an FCC Decision to not require Multilingual EAS Alerts. This issue has been brewing for a very long time with many groups pressing the FCC to require Public Warnings be in languages other than English. The Court decision was, as you might imagine, now well received by those that have been pressing for it. Words like – ‘deep displeasure’ – ‘irrational and heatless’ were frequently heard. This whole issue got a big boost after Katrina when over 100,000 Spanish-speaking residents were left with no information on the media in their language. It appears pretty clear that the FCC is not going to require broadcasters to air EAS Messages in other languages for the foreseeable future – Bottom line it sounds like Broadcasters don’t have to broadcast EAS Alerts in other that English- However you have to report to the SECC your procedure for doing it. Certainly this will be a topic at the next Washington State SECC Meeting scheduled for Tuesday, November 14th, at the Building 11 Radio Conference Room at Clover Park Technical College. 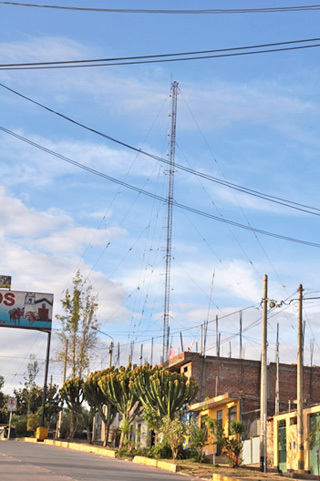 In yet another battle involving an FM Translator….KLUS-FM came out the winner after a 13 month long battle with a co-channel translator. Critics are upset because full power stations are keeping smaller markets in the vicinity from having their share of the FM Band. A lot of this may depend on how much attention the previous occupant of the frequency are paying to the rapid increase in translators. Some stations are, perhaps, not ‘watching the store’ while other are paying very close attention…Knowing that the FCC is not going to automatically side with them. The FCC is taking a page from their ‘wardrobe malfunction playbook’ and is starting to issue huge fines for Pirate Radio operations going north of $100,000. My question remains- What percentage of these operators actually pay the fine? 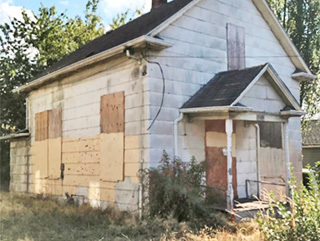 Recently the FCC has been going after property owners where a lot of this activity originates…That could help – provided they don’t try to skate on paying the fines also. Never assume a conspiracy when incompetence is sufficient to explain the facts! As part of the FCC’s modernization, it looks like the requirement to have a paper copy of the FCC’s rules on hand may be going away, thus ending a 40 year old requirement. Seems to make sense in this day and age of wearable/portable on-line capable electronic gizmos. Only down side is when that Cell Site or Internet connection goes down, you will be left with trying to remember the rules you are required to be compliant with. This brings up the whole concept of how dependent we have become. Talk with the folks in Puerto Rico with No Power, No Internet. Our day will come too when we experience our ‘Big One’. There are going to be a lot of totally helpful folks out there. Can you imagine dealing with kids that suddenly have no hand-held entertainment? Ouch. 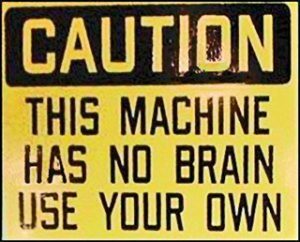 Nothing like a warning sign that will bring a smile! Over the years doing a large part of my work around transmitters and antennas I’ve encountered someone that wanted to know of a publication they could pick up to help them comprehend the mysterious world of RF, especially that magical gizmo that launches that signal in the air, the Antenna. I’ve rather consistently pointed to the ARRL – The Amateur or Ham Radio organization. Occasionally I will receive a funny look in doing so as this is not where some expect to find good solid and instructional information. 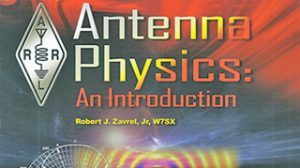 Happy to report the ARRL has a new publication called ‘Antenna Physics’. 160 pages of information that anyone who is involved with RF will want to have on their shelf. I have to wonder just how many tower-related accidents will take place as a result of re-packing, causing a shortage of experienced tower crews? As anyone who knows much about Seattle will tell you – Seattle is a very liberal place. Well, Forbes is out with results of a new survey and you were right – They rank Seattle as the 3rd most liberal city in the country. As you may have guessed, San Francisco is rated #1. Interesting to watch what’s been going on in Texas, where two stations, not commonly owned, are using similar call letters. In this case it’s KCTI vs KCTI-FM. The owner of KCTI was late in objecting to the FM’s call letters and the FCC said…”Sorry too late”. Here in Seattle, we have a couple of long-standing call letters – KING and KIRO. At one time each of these calls were under common ownership. Today KING AM is gone, but KING-TV is owned by Tegna and KING-FM by a non-commercial ground. 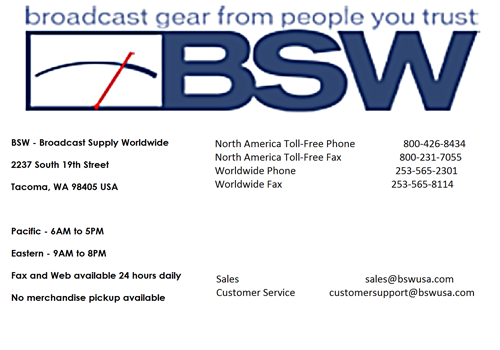 KIRO-AM and FM is owned by Bonneville and KIRO-TV is owned by Cox. Many people I talk with still believe they are commonly owned. Zooming in on the top of the tower you can see what appears to be a vertically polarized FM antenna. From the looks of the guy wire insulators and the wires parallel to the tower in the bottom of the frame, the tower may be used for AM as well. Nothing like this around here! 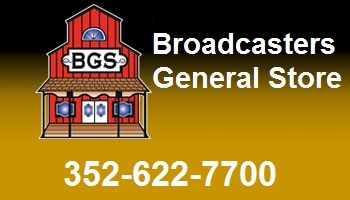 Looking for a job on the technical side in Radio? Understand Wisconsin Public Radio, Duhamel in Rapid City S.D. and more locally Bi-coastal Media in Oregon have openings. Once again we have an example of how terms from the past, for reasons unknown, appear to be required in the present. Example is this story – for Greg Agvent, senior director of CNN Air (the news channel’s drone division), drone footage provided viewers with a heightened “context, perspective, and understanding” of Harvey/Irma/Maria’s appalling damage. Footage? Really! How do drones provide footage? Perhaps in the same way that you will still hear the terms, ‘Caught on Film’ or ‘Film at 11’? Or the old video of a reel-to-reel tape recorder when an audio clip is being played? The name EMF is becoming more familiar as the non-profit ownership of adult contemporary Christian Music has expanded to 770 stations and translators. More survey stuff – We all know that Seattle’s rapid growth has pushed the cost of housing rapidly upward. The question asked in this survey, “What are the 25 most expensive cities to move to”? Coming in at #16 is Portland-Vancouver. The cost of living there is 1.8% higher than the national average. #12 is Metro Denver (Including Aurora and Lakewood). There the cost of living is 6% higher. #10 is Seattle-Tacoma-Bellevue. Here the COL is 9.4% higher than the national average. Yes, it’s an oldie (built in 1901) in Seattle’s Ballard neighborhood. Price – $595,000!! I was recently watching one of those channels where they show homes for sale to potential buyers. In this case they were showing, very livable 2400 sq. ft., 3 bedroom, 2 bath homes for under $200,000 in Nashville, Tenn. What a contrast! Another local firm to brag about – Costco, based in Issaquah (just east of Seattle), is doing very well with reportedly over 90 million members. If you rank grocery retailers, Costco is now #3 behind Walmart and Kroger. Coming up fast is Amazon, currently in 5th place. I should note that this is looking at 6 Plus, Monday-Sunday, 6 a.m. to midnight. Certainly the success of non-commercial stations in the Seattle market cannot be overlooked. During some time segments, their numbers are even more impressive. For example, KNKX is pulling a 6.6 Share or #3 in the mornings. I have to wonder how much this is noticed in the programming offices of leading commercial stations? From the category of, ‘Occasionally there is a bad dude’, comes the story of Robert Berlin in DuPage, Ill., who has been sentenced to 8 years for stealing approx. $400,000 from the College and house of worship where he worked as an engineer. He had worked there for 30 years. One thing I love about my job is the ability to get out of the city and see some of our beautiful state. 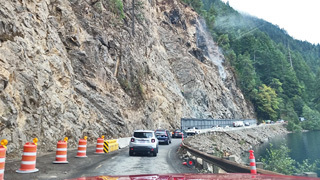 This picture was taken, while we were stopped awaiting work being done on the rock-face next to the road on US 101 west of Port Angeles. The water on the right is Lake Crescent. If you look closely, you can see what looks like smoke. This is where they are drilling into the rock to install bolts to help hold the rock together. Not unlike Snoqualmie Pass, this area has been the scene of falling rock for years. When they are done, the loose material will be gone and, as I understand it, screening will be placed on the rock to protect those that are driving below. This piece of roadway is going to be closing now 4 hours per day, Monday – Thursday from 9 a.m. to 1 p.m. If you are planning a trip to the west end of Clallam County, you might wish to factor this in. Both of the alternatives are real time-eaters. SR112 along the northern end of the peninsula or via Aberdeen on the south. Wonder how things will be changed next April for NAB in Las Vegas in light of the recent mass killing by a shooter? Already there have been a number of steps taken to increase security. No small chore for a city like LV where almost 43 million visit annually from all over the world. A lot of the changes will likely not be visible so as to not tip off those that they are trying to stop before they do harm. TV Stations – DOWN. That’s correct. 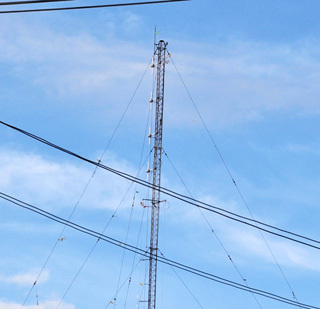 According to a new FCC report, more than 500 UHF/VHF Stations have gone dark in the last 5 years. Now there is a word that you want to work into your next email or chat with a friend. Now to what it means. 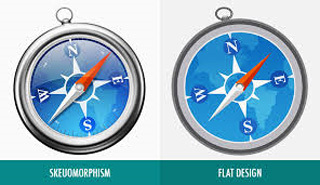 Skeuomorphism is where an object in software mimics its realworld counterpart. 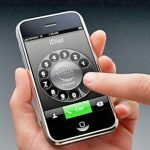 Obviously, telephone dial, complete with finger-stop, is not real. It’s just made to look that way with a 3-dimensional looking 2-dimensional display on this smart-phone. Here’s another example – The Switch on the left looks real, as if it were a photograph. It’s made to look 3 dimensional. A two dimensional switch might look like the one on the right. Below is another example with a round knob and linear controls. You have obviously see this kind of thing. NOW you know what to call it! In filling out an application, where it says, “In case of emergency, notify… ” I answered, “a doctor”. Going to church doesn’t make you a Christian, any more than standing in a garage makes you a car. You are never too old to learn something stupid. I’m supposed to respect my elders, but it’s getting harder and harder for me to find one now.